Considered the capital of the agreste region, Caruaru is 132 kilometers (52 miles) west from Recife. Every June 24, the city seems to compete with Campina Grande (in Paraiba) to hold the largest Festa de São João in Brazil. Though Campina draws more people, the festivities last longer in Caruaru, where they begin the first weekend in June and end nearly one month later. The celebration is headquartered at Patio de Eventos Luiz Lua Gonzaga, an exterior portico of the Espaҫo Cultural Tancredo Neves. Every year during the festival, this cultural center features an exhibit known as Vila do Forro, a reproduction of a typical Brazilian country village. The festival brings quadrilha dancers, guitarists, and repentistas (improvisational musical poets) out into the streets to perform alongside groups of marching bacamarteiros. The latter get their name from the wide-barreled traditional firearms (bacamares) they carry while parading to the rhythm of the xaxado music being played by small bands of accordions, triangles, zabumba drums, and pífanos (flutes). Caruaru also has attractions for those visiting during the other 11 months of the year. The town is home to the biggest street market in the Northeast, the Caruaru Market. Also worth a visit is the Museu Casa do Mestre Vitalino muse UI11, which honors the town's most illustrious son. To reach Caruaru from Recife, head west on BR-232, a rare, well-maintained, two-lane highway. From Campina Grande, take BR-104 going south. Set up in the more than 150,000 square meters (1,615,000 square feet) of the Parque 15 de Maio, this is the largest market in the Northeast. Shoppers will find stalls here featuring everything from artisans to faith healers, medicinal herbs to electronic goods. It's a good idea to shop around before you buy, since prices differ significantly from one stall to the next. On Saturdays the market sells only food and crafts, and gets so crowded that it is difficult to move around. Monday brings the Feira da Sulanca (a local term for clothes made by small manufacturers), when retailers from other cities visit in search of inexpensive merchandise to sell in their own stores. Parque 18 de Maio, Centro. Opcncd ro visitors in 2002, this virtually untouched and undeveloped park lies in the Vale do Catimbau valley, surrounded by the mountain ranges of Buíque. The park is approximately 25 kilometers (16 miles) southwest of Arcoverde. 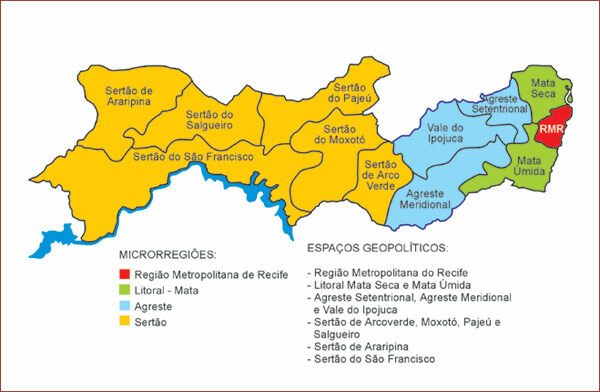 The terrain runs from semi-arid agreste to sertão, encompassing caatinga, Atlantic forest, rocky woodland, and cerrado. This diverse landscape supports about 150 bird species, including the hooded siskin , a native of the Northeast. The park's greatest attraction is its unusual rock formations. Rock walls take on unusual shapes and are naturally colored in vivid reds, yellows, and blues, the result of weather change and erosion over time. Catimbau is also the second largest archaeological park in the country, on account of the prehistoric paintings and engravings that adorn the rocks. The chief excavation site in the park is at Alcobaҫa. You can refresh yourself and top off your canteens at Paraiso Selvagem, a spring with natural pools for bathing. You can explore Catimbau's 62,300 hectares (154,000 acres) on foot or by 4x4 vehicle. You must be accompanied by a guide (English speakers available) from the Catimbau Guide Association. To get to the park from Recife, head west on BR-232 to Arcoverde, then south on the PE-076 highway to Buíque. Both roads are in very poor condition. dedicated to his father and housed in the home the artist built for himself in 1959. The museum features examples of the master's work (none are for sale) as well as his personal items. Down the road from the museum you'll find the workshops of several other artisans, most notably Luiz Galdino (Rua Mestre Vitalino, 455), Manuel Eudócio (Rua Mestre Vitalino, 151) and Familia Zé Caboclo (Rua Mestre Vitalino, 66). The Espaҫo Cultural Tancredo Neves cultural center was opened in 1988. The center houses the city's two most important museums: the Museu do Barro Zé Caboclo, and the Museu do Forró Luiz Gonzaga. The Museu do Bano Zé Caboclo is on the first floor, block B, of the complex. It features some 2,300 clay pieces. Exhibits are divided into five areas. The Sala Ceramistas do Alto do Moura (Alto do Moura Ceramists' Room) displays the work of all the major local artists, with the exception of Mestre Vitalino, whose 67 pieces get their own room. Among the Vitalino holdings is O Homem e o Gato Maracajá (The Man and the wildcat), considered the artist's first important work in clay. The Coleҫão Abelardo Rodrigues displays works from other important folk art centers in the Northeast, including Tracunhaém, Petrolina, and Goiana. The museum also has a contemporary art gallery and a space for temporary exhibitions. The Museu do Forró Luiz Gonzaga is on the ground floor of the same block. The museum takes its name from Luiz Gonzaga, the first musician to bring local forró music to audiences outside of the sertão. The museum's extensive collection of Gonzaga's instruments, clothes, and records is spread over three rooms. There is also an entire room dedicated to the festivities held every June in the "Capital of Forró" as Caruaru is known. An annex of the Tancredo Neves center houses Espaҫo Elba Ramalho, which displays the clothes and personal effects of forró singer Elba Ramalllo, who, though born in Paraíba, is now an icon of forró in Caruaru. Praҫa Coronel José Vasconcellos, 100, block B, Centro. Caruaru sprang up around the 630-meter (2,070-feet) high Morro do Bom Jesus hill. The chapel at the top of the hill was originally named Capela do Socorro, but was renamed the Capela do Bom Jesus by the local Diocese. The lookout points on the hill offer sweeping views of the Caruaru Market and Mauricio de Nassau, the city's nicest neighborhood. Bezerros is best known for its woodcut prints and Carnaval panpagus (papier maché masks). The town is 27 kilometers east of Caruaru and 20 kilometers west of Gravatá, at Km 107 on BR-232. It is worth a visit to Bezerros to see the studios of the artisans who specialize in these traditional craft forms, such as woodcut master J. Borges and papier maché artist Lula Vassoureiro. Also worthwhile is the headquarters of the Associaҫão dos Artesãos, which sells a wide variety of pieces. A trip up to Sena Negra affords excellent views and an opportunity to visit the Pólo Cultural. This memorial - actually a studio - honors 70-year-old Bezerros native José Borges, the most famous of Bezerros' woodcut print artists. J. Borges still produces work, though at a slower pace than before due to his declining health and numerous trips abroad to lecture. When he is in town, the memorial is where he receives visitors, makes his pieces, and hands down his artistic knowledge to his children and grandson. Avenida Major Aprígio da Fonseca, 420. The Pólo Cultural is in the village of Serra Negra, 10 kilometers (6 miles) from downtown Bezerros. This imposing concrete structure stands in sharp contrast to its lush green surroundings and the Serra Negra mountain range. The view from atop the range is stunning, and the trails winding through the area are popular with locals and visitors alike. The center has a lovely open-air amphitheater that features regular music and theater productions. Vila de Serra Negra, Zona Rural. The Associaҫão dos Artesãos is one of the best places to buy the signature handicrafts of Bezerros. The association operates out of a building owned by City Hall, which allows the artists to sell their work at low prices. Traditional masks, like the paper maché papangu, as well as others made of wood and fabric, are sold by many of the association 's artists. Rua Vigário Manuel Clemente, 123, Centro. A combination museum, workshop, and store, the Centro de Artesanato de Pernambuco rivals similar centers found in the capitals and big cities of the Northeast. The museum and store exhibit items from practically every municipality that produces craftwork in the state of Pernambuco. Students at the workshop are taught woodcutting and mask-making. Avenida Major Aprígio da Fonseca, 1100, km 107, BR-232. Carnival celebrams in Bezerros first donned masks to parade through the streets in the early 20th –century. These early masks were simple, made from wrapping paper or cardboard, and were dyed with natural ingredients (like bean leaves). It was a tradition in tills era to give masked revelers gifts of fruit, eggs, beiju (sweet manioc starch cookies), and even chickens. Through the years these masks have become increasingly elaborate. The offerings given to the mask wearers have changed over time, as well. When residents of Bezerros began serving mask-wearers angu (cornmeal mash), the masks soon came to be known as papangus (literally, "those who eat angu"), an iconic symbol of Carnival in Bezerros. Lula Vassoureiro masks can be bought at his workshop, as well as other paper maché artwork (like dolls). Rua Otávia Bezerra Vila Nova, 64, Santo Amaro. Built at an altitude of 447 meters (1,470 feet) , blessed with an average annual temperature of 21°C (70°F), and well supplied with fondue restaurants, Gravatá deserves the nickname "The Switzerland of the Northeast". The town is 80 kilometers (50 miles) west of Recife on the BR-232 highway. Its European climate complements its Brazilian traditional celebrations. June festivities attract crowds, as does the August Festa da Estaҫão , which marks the end of the Circuito do Frio winter festival. Four other municipalities - Caranhuns, Pesqueira, Triunfo, and Taquaratinga - participate in the state government-supported August festival, which includes workshops, lectures, and musical presentations (Patio de Eventos Chucre Mussa Zazar, Avenida Joaquim Dedier, Centro). The industries that sustain Gravatá's economy - furniture, food, folk art, and flower cultivation - host the annual Festival de Setembro, featuring 1,500 square meters (16, 100 square feet) of stands displaying the town's accomplishments. A station in the most Literal sense, the Estaҫão do Artesão in the town's old railroad station displays the work of approximately 60 artisans. Gravatá's Artisan Association runs the space with support from City Hall. The Estaҫão's two rooms showcase pieces in wood and fabric and canvases by local artists. Rua João Pessoa, Centro. The replica of Cristo Redentor (Christ the Redeemer) with his arms stretched over the city, atop the Morro do Cruzeiro, is visible from all of Gravatá. Installed in July 1941, the monument is 7 meters (23 feet) tall and 8 meters (26 feet) wide at the base. It is as-minute drive from Igreja de Santana church or a 15-minute climb from the foot of the hill up the 365 steps of the Escadaria da Felicidade. The view from the highest point in Gravatá is extraordinary, especially at sunset. A restaurant and a radio station also squat atop the hill. The 60 stores concentrated in the Pólo Moveleiro area sell furniture, wooden decorative items, and craftwork. Don't expect to find only local merchandise here: the stores sell pieces from all over the Northeast. Rua Duarte Coelho. Though it is located in a hilly area 230 kilometers (143 miles) southwest of Recife, thus boasting an average annual temperature of21°C (70° F), Garanhuns' claim to fame, is as a political hotspot: hometown of former President Luiz Inácio Lula da Silva. But Garanhuns is more than just the self-proclaimed birthplace of the union leader who became president. It is the Northeast's largest mountain city and home to the popular Festival de Inverno. This event currently kicks off the Circuito do Frio festival and attracts visitors from all over Brazil. Castainho, a community descended l1-om runaway slaves, is also part of Garanhuns. Some of its residents trace their facilities back to the fugitive slave community Quilombo dos Palmares. The top of Colina do Cristo Magano offers the best view of the city. While you're there, snap a photo of its 4 meters (13-foot) picture-postcard flower clock (Praҫa Tavares Correa, at the beginning of Avenida Rui Barbosa). To get from Recife to Garanhuns, take the BR-232 highway west to Km 150 (São Caetano), then go south on the BR-423 highway. Garanhuns hosts the Festival de Inverno during July vacation. It's one of the main events on Pernambuco's tourist calendar. For ten days, various parts of the city host artistic presentations and workshops on visual arts, dance, literature, fashion, heritage, music, and theater. Festival de Inverno is organized by the Pernambuco State Department of Education and Culture (Fundarpe) in partnership with Garanhuns City Hall. Since its so-called Nova Jerusalem theater complex opened 37 years ago, Fazenda Nova, 187 kilometers (116 miles) west of Recife, has gained international fame. The largest open-air theater in the world at 100,000 square meters (one million square feet), Nova Jerusalem has an area equivalent to one third of the walled area of the original city of Jerusalem. The sculptures in Pm'que das Esculturas Monumentais Nilo Coelho are another city attraction. (Rua Antonio Lupe). The 60-hectare (148-acre) sculpture park contains 37 granite sculptures, some 2 meters (6.6 feet) tall. They represent religious, musical, folkloric, and other cultural aspects of the Northeast. In 1951, entrepreneur Epaminondas Mendonҫa thought to stage the Passion of Christ in the streets of Fazenda Nova. Journalist Plinio Pacheco, who arrived in the city in 1956, expanded upon Mendonҫa's plan, with the vision of building a replica of Christ's Jerusalem. The first performance in the new theater, however, did not occur until 1968. Every year since then, from the day before Palm Sunday until Holy Saturday, an audience of around 8,000 has watched this performance of the best-known story in Western culture on nine enormous stages. Aided by the latest in special effects technology, 500 actors - including Brazilian television celebrities - perform for two and a half hours. The huge audience's members often become supporting actors in the interactive performance. The Good Friday show tends to be the week's most popular.